Seriously. Whether your decor style is boheme, graphic, classic or trendy, she has you covered. It's kind of amazing. I'm sure many of you are already familiar with Arianna's keen eye for style, design and organization (anyone else need to take notes on those organization skills like I do?). But just in case she's new to you, I recommend a visit to both her blog and shop. Just when I think I can be strong, she comes out with a new pillow and I'm back to drooling. I'd like a set (one of each) too please! I am an addict first step is admitting to my pillow addiction --I may have to pair the white with navy border with the last pink ikat. so fun! 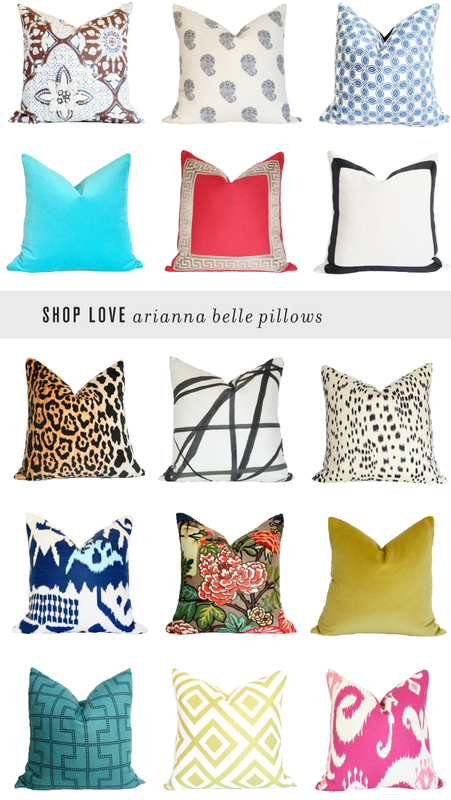 Those pillows are so fabulous! I'm going to visit the shop asap - thanks!